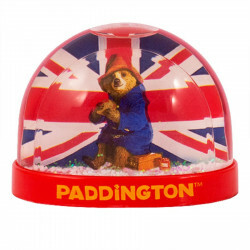 The essential Paddington Bear snowglobe ! For 15€ spent on the Paddington Bear collection, a hand-spinner with the colours of the British flag is offered. A great gift with the little london bear. This is not a toy, does not suit children under 3 years old. On Christmas Eve 1956, Michael Bond sees a little teddy bear alone in a department store in London. He offers it to his wife and calls it Paddington since at the time the couple lived near the station of the same name. A few years later, in 1958, Michael Bond wrote a story based on this character in "a Bear called Paddington" first published in the United Kingdom. Elected best childrens' book in 1959, "a bear called Paddington" is then translated into many languages. Growing success, other books on the adventures of the bear appear. With his duffle-coat and his favorite marmalade, Paddington has become an emblematic character and symbol of the UK all over the world. For the release of the film Paddington 2, a range of products is marketed. Find stuffed toys of Paddington Bear in different sizes with its red hat and blue duffle coat, a kitchen towel, a children's umbrella, kits, a purse, mugs and snowballs. Paddington is with you at home for the pleasure of young and old alike!